Whether you need twin, full, queen or king size headboards, they are always available at our warehouse. Choose from a WIDE variety of styles. Whether you need a twin, full, queen or king-size headboard, a gorgeous and extensive collection is always available through Mattress for LESS. Choose from a WIDE variety of styles that are guaranteed to add the perfect touch of functional beauty to any decor. 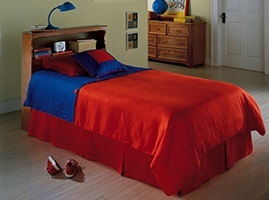 Give your bedroom a makeover with help from our complete line of bedding solutions. Hillsdale Furniture maintains its position in the bedroom furniture design community by only offering attractive design elements backed with high-quality construction. Stocking these impressive headboards, we strive to stay on top of bedroom design trends so we can offer the right mix of finishes, styles, and sizes for today’s consumer. With Hillsdale Furniture’s collection of headboards, available at our three Connecticut locations, Newington, Wallingford and Waterbury, updating your space at a reasonable price,without sacrificing style and sophistication, has never been easier. Take pride in knowing you have a headboard from the best manufacturers. You’ll get the best value, selection and service through our three Connecticut locations, Newington, Wallingford and Waterbury. Need tips for choosing the right headboard? A headboard is definitely what changes the look of the bed. It makes it look more solid and sturdy. It’s a nice combination which introduces some rustic charm into the bedroom. There is a certain beauty in a combination of materials, particularly that of wood and iron. Spanning linen, velvet, leather, and more, upholstered headboards offer padding that makes them more comfortable to lean against. The upholstery can be left simple and unadorned or finished with detailing. Button tufting, nailhead trim, and welting are the most common finishing touches. Inspired by the classic chair, wingback styles feature arms that extend from the edges of the headboard, and often include tufting and nailhead trim. Created by a series of metal rods, this headboard option offers open designs instead of a solid backdrop. Wrought iron, brass, and brushed steel are just a few of the finishes available in this durable material. You can also find distressed options or ones that incorporate wood elements. 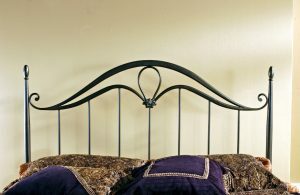 The ends on the metal—as well as the pattern the rods create—can skew the headboards vintage, traditional, or modern. This traditional bed material is anything but when it comes to style: It can be stained or painted and designed with classic or contemporary lines. 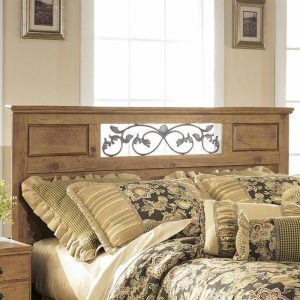 There are a few iconic styles that fall within wood headboards, including panel, slat, and sleigh. Some metal headboards also feature wood elements. While there are no fixed standard heights, headboards are sized based on standard bed sizes: twin, full or double, queen, king, and California king. Resist the urge to size down, as those few inches make all the difference to the eye once in context with the rest of your bed. 1. Wall mounted: Requires a flat surface to drill into, but works with any bed frame. 2. Bed-frame mounted: Creates a stand-alone bed once installed. Check your current frame carefully to ensure it has compatible brackets. 3. Freestanding: Comes without any hardware or pre-drilled holes, but usually can be easily outfitted to be either wall or bed-frame mount. YOU ARE IN GOOD HANDS WHEN YOU SHOP AT MATTRESS FOR LESS! You will have help choosing the perfect headboard to compliment your style, stay within your budget, and fit into your room. Your satisfaction is a number one priority so you’ll be served in a friendly and efficient manner.